Millions of Americans and a few dozen people from other regions of the globe will sit down this weekend to watch the NFC and AFC Championship games. Both games should be pretty good, but no matter how interesting they are, you’ll still need something to do during the commercials besides go for chips and beer and bathroom breaks. I’ll share with you two companions that I plan to have with me during the games. And they both involve attractive visualizations. The first is the New York Times 4th Down Bot. This is a web site that compares every 4th down situation in the game with a model developed by Brian Burke of AdvancedNFLStats.com. The Bot will then tell you whether the coach should choose to go for it, punt, or kick a field goal. The model was built from 10 years worth of football statistics and calculates how each decision impacts the number of expected points for that team. The idea is that coaches should be trying to maximize expected points (how many points they score minus how many points the other team scores) when the make their 4th down decision. This sounds incredibly obvious but according to the 4th Down Bot coaches are much more conservative than the model would predict. For example, look at the graphic below. For each position on the field and 4th down distance to go, the graphic shows what decision would maximize expected points. If you are on the opponents 20 yard line and it’s 4th and 15, you should kick the field goal. So far so good. But look at what the model recommends for 4th and 1 at your own 11 yard line. It says you should go for it! I don’t think there’s ever been an NFL coach who’s gone for it in that situation, unless it’s very late in the game and you’re behind. You can see how much more conservative actual coaches are by looking at the right side of the graphic. One explanation that’s commonly given for this discrepancy is that coaches are not simply trying to maximize the chances of winning. They are also risk averse and fear making a controversial decision to go for it, which, if it fails, would incite the rage of the fans and media. There is something to this, but I don’t think it can explain the whole phenomenon. You would think that a maverick coach who starts going for it on 4th and 1 deep in his own territory would eventually start winning more games, and other coaches would feel safer and start copying him. So I don’t know why coaches seem to play more conservatively than models would suggest they should. But as a fan I can say that intuitively I do think my team should go for it more often on 4th. It’s fun to watch the game, and when a 4th down comes up, pretend you’re the coach and decide what to do. Then check what the Bot says. You can follow it on twitter at @NYT4thDownBot . The second tool is seismic analysis of the vibrations caused by the crowd at the Seattle Seahawks stadium. The Pacific Northwest Seismic Network installed three seismometers under the stadium, which is legendary for its crowd noise. They are planning to make near real-time seismographs available during the NFC Championship game, so you can follow all the action during the game. 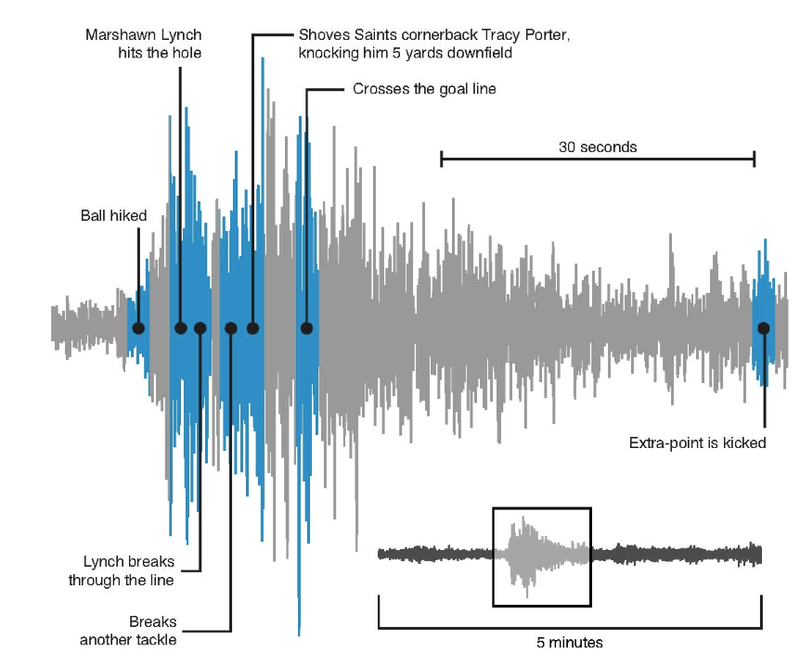 If you’re a Seahawks fan, but you get too nervous to watch the game, you can just wait until you see a big spike in the seismometer, and then turn on the game to watch the replay.